Born into a musical family, Greg Mulligan began studying violin at age eight. His siblings, a younger brother and two sisters, also play string instruments, leading to the creation of a family string quartet. Greg received his Bachelor of Music degree from the Eastman School of Music and Master of Music degree from Indiana University, where he studied with Josef Gingold. 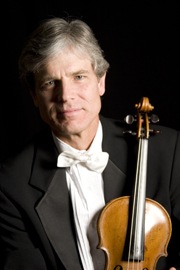 Greg has performed as a member of the First Violin Section of the Baltimore Symphony Orchestra since 1980, except for five years when he served as Concertmaster of the San Antonio Symphony from 1989 through 1994, and as Concertmaster of the Colorado Music Festival in 1990 to 1991. Since 1995, audiences have enjoyed listening to performances of Greg with the Atlantic String Quartet, of which he is a founding member, and he also performs with Pro Musica Rara, a Baltimore early music ensemble. He has served as Chair and co-Chair of the Baltimore Symphony’s Players Committee for several years now, and has been the BSO’s ICSOM delegate for the last six years.